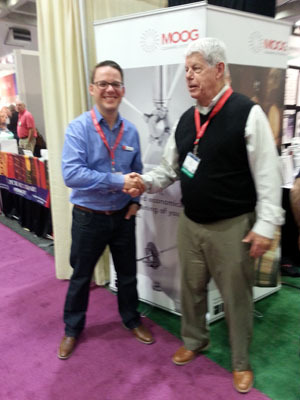 McCormick Expo Center, Chicago September 13 thru 16 where we exhibited at the Process Expo Show. 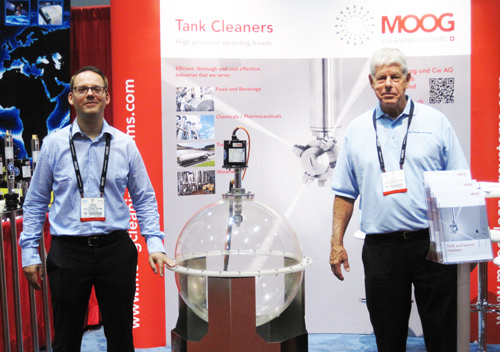 We displayed eight different high pressure MOOG tank cleaners with the air, electric and hydraulic drive. Many attendees were excited to see the high pressure cleaning, up to 3600 psi, and definitely saw areas where the high pressure cleaning would work well in their operation We were advised that it would qualify with the popular characterization of “green” in that it operates with minimal water (normally 4 – 10 gpm). The less cleaning water used the less waste is generated. Let us know if you have an application that you would like to discuss. We can even provide a demo unit for you to test out in your cleaning operation. 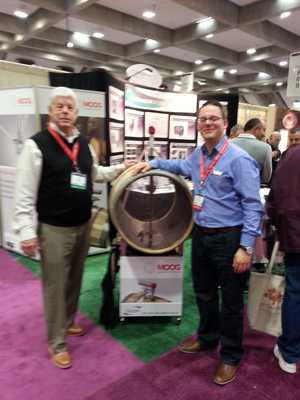 Here we are with Florian Ernst of Moog at the Wine and Grape Symposium at the Sacramento Convention Center January 27- 28. There was much interest at this trade show in the Moog barrel cleaners. The barrel cleaners are similar to the tank cleaners in that they both provide 360 degree high pressure cleaning to the inside of the vessel. However, since the barrels do not have a bottom outlet as do most tanks, the barrel cleaners not only provide high pressure cleaning water they also provide a siphoning of the wash water from inside the barrel.This is done by means of a suction tube which is an integral part of the barrel cleaners. The major portion of the high pressure water provides the cleaning spray while the remainder of the high pressure water provides a venturi suction of the water from the barrel.